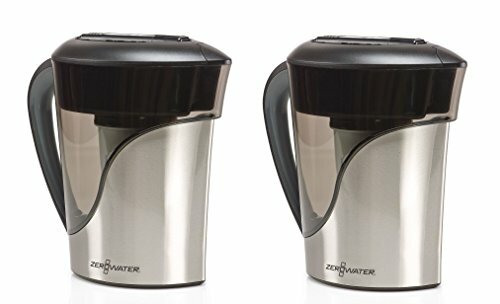 ZeroWater 8 Cup Stainless Steel Pitcher with Free TDS Meter (Total Dissolved Solids) - ZS-008 (Pack of 2) by ZeroWater at Friv 4 Friv . Hurry! Limited time offer. Offer valid only while supplies last. ZeroWater is not an ordinary water filter! ZeroWater delivers a unique 5-Stage Ion Exchange technology compared to conventional 2-Stage filtration. ZeroWater is not an ordinary water filter! ZeroWater delivers a unique 5-Stage Ion Exchange technology compared to conventional 2-Stage filtration. Enjoy the purest tasting water with a filter that removes 99.6% of TDS (total dissolved solids) from your tap water, such as Aluminum, Zinc, Nitrate, Fluoride and more! It is the only water filter that meets FDA standards for TDS in purified bottled water. This provides you with a pour-through, gravity fed filter certified by the NSF to reduce Lead and other heavy metals; such as Chromium 3 and 6. You will know when it's time to change your filter as every pitcher comes with a water testing meter, which measures the total dissolved solids in your water.